Rosabeth Moss Kanter, whose strategic and practical insights guide leaders of small and large organizations worldwide, is the recipient of the 2016 Everett M. Rogers Award. Professor Kanter received the award and delivered the annual Rogers lecture at the USC Annenberg School’s Wallis Annenberg Hall on Monday, March 7, 2016. Kanter is the Ernest L. Arbuckle Professor at Harvard Business School and also the Chair and Director of the Harvard University Advanced Leadership Initiative, an innovation preparing accomplished leaders at the top of their fields to transition to their next years of service addressing national and global challenges. She is author or co-author of 19 books, including Confidence, a New York Times bestseller, and the award-winning classics Men and Women of the Corporation and The Change Masters. Read the press release. Kanter has translated her wide-ranging research – on corporations and sports teams, entrepreneurs and executives, utopian communities and government agencies – into guidelines for successful and principled business practices, strategies for innovative leadership and new priorities for public policymakers. 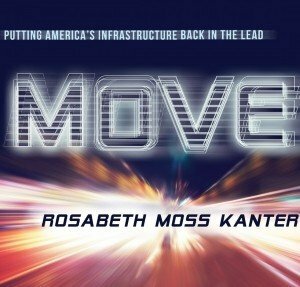 Her latest book, MOVE: Putting America’s Infrastructure Back in the Lead, lays out her ambitious agenda for a fundamental rethinking of how cities could work, going far beyond repairing our decaying transportation systems.